Joseph W. Snell, ed., "Diary of a Dodge City Buffalo Hunter, 1872-1873," p. 345. James C. Malin, "Eugene F. Ware, Journeyman Poet—Acceptance by Fort Scott," p. 396. Bypaths of Kansas History, p. 442. Kansas History as Published in the Press, p. 445. Kansas Historical Notes, p. 452. Errata, Volume 31, p. 456. 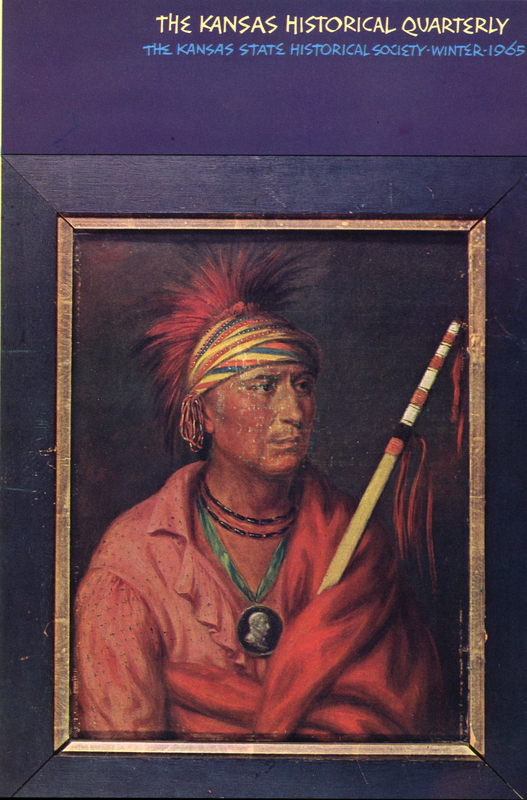 Na-che-ning-a (No-Heart-of-Fear) was second chief of the Iowas and about 35 years old when Charles Bird King painted his portrait in 1837. In 1848, the year he became principal chief, missionaries to the Iowas (in present Doniphan county—see Kansas Historical Quarterly, v. 31, p. 143) wrote of him: "under good influence [he] will always be a fine man"; he "shows some concern for the welfare of his people"; is "a friend to the whites"; is "very friendly to education. . . " Portrait courtesy Smithsonian Institution.